Seen nearing completion of her loading at Renfrew, the Nassau-registered coaster SWAMI sailed in the early hours of Tuesday morning with her cargo of scrap metal, destined for Newport, in South Wales. Built in 1995, SWAMI sailed for nine years as SWAN, before joining the Arklow Shipping fleet and having her name prefixed appropriately. 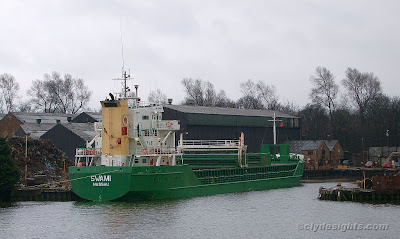 Although now owned by a Norwegian company, Misje Rederi AS, she remains under the management of Arklow Shipping. Her deadweight is 4,304 tonnes, and her length 90.46 metres overall. She was completed in 1995 at the Bodewes shipyard in Holland.